Appearances of ‘Mary’: Is It the ‘Blessed Mother’ or a Demonic Spirit? A woman named Maryann once commented on my own personal testimony and she testified of how she also left the Catholic church as a teen, after she questioned the teachings of the church. Maryann’s mom told her that she was an atheist when she heard her daughter say that she believed the apparitions (appearances) of Mary were Satanic. I was not surprised at all by the reaction that Maryann received from her mom. Why? Because I know that we are involved in some serious spiritual warfare, and I know because I was once on the other side of the fence. I was also a staunch defender of the Marian apparitions at Medugorje, Yugoslavia, previous to my becoming born again of the Spirit. 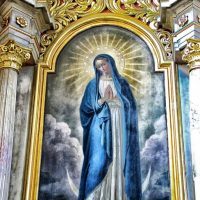 After my conversion, it was the Spirit of truth (Holy Spirit) who opened my eyes to the gross deception of the “Marian apparitions” as well as the entire Roman Catholic system.